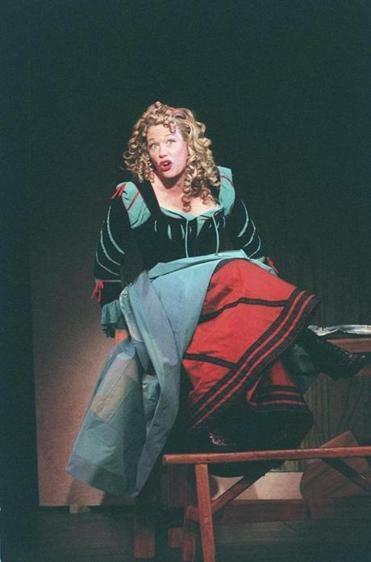 Ms. Mazzie’s performance in “Kiss Me, Kate” garnered her one of three Tony nominations. NEW YORK — Marin Mazzie, a musical-theater actress whose Broadway work earned her three Tony Award nominations in six years, died Thursday at her home in Manhattan. She was 57. Her husband, actor Jason Danieley, said the cause was ovarian cancer, a disease she had spoken about often since receiving her diagnosis in 2015. Her next two Broadway appearances also brought her Tony nominations, both for best actress in a musical. One, in 1998, was for her performance as the stifled Mother in “Ragtime.” The other, in 2000, was for a role that was in some ways the polar opposite of Mother: the female lead in the 1999 revival of “Kiss Me, Kate,” the musical drawn from Shakespeare’s “The Taming of the Shrew” and featuring play-within-a-play warfare between the two stars. Ben Brantley, in a glowing review in The New York Times, found Ms. Mazzie’s versatility in the handling of her musical numbers especially noteworthy. Ms. Mazzie continued to perform after her cancer diagnosis, appearing most recently on Broadway in 2016 in “The King and I” as a replacement for Kelli O’Hara in the role of Anna. She also sang on concert stages and in cabarets all over the country. She and her husband (who is now appearing on Broadway in “Pretty Woman”) often performed together, creating two-handers from the American songbook. They were to unveil a new one, “Heart to Heart,” at the nightclub Feinstein’s/54 Below in Manhattan in mid-June but had to cancel it because of Ms. Mazzie’s health. Marin Joy Mazzie (pronounced MARE-in MAY-zee) was born on Oct. 9, 1960, in Rockford, Ill. Her father, John, ran a television station, and he and her mother, Donna, were devotees of musical theater, a passion reflected in their record collection. A key moment happened when she was 8 years old and saw a touring company of ‘‘Carousel’’ starring John Raitt. In the second act, Rockford was plunged into a blackout and the actors needed flashlights to finish the show. After it ended, Raitt came out and sang for the audience until it was deemed safe for everyone to go home. He sang for 45 minutes. ‘‘I will never forget that moment,’’ Ms. Mazzie recounted in ‘‘Making It on Broadway,’’ a book of Broadway stories. She began taking singing lessons at 12. Then her family moved to Kalamazoo, Mich., where she attended Western Michigan University, graduating in 1982 with a minor in music and a major in theater. In 2003, she and another alumna of the university, actress Barbara Marineau, teamed up for a pair of concerts there, proceeds from which were used to create a music theater performance scholarship that is now awarded in their names. From 1980 to 1982, Ms. Mazzie was also a “Barnie,” working at the Barn, a famed summer theater in Kalamazoo. It was a fast-paced training ground that mounted a new show every couple of weeks, the actors performing in one while rehearsing the next. She earned her Actors Equity card there, and she returned several times in later years as a guest artist. With the card and the college degree, she moved to New York. She soon landed a dinner-theater job in Westchester County in the chorus of “Barnum.” In 1984, she was cast in a touring version of “Doonesbury,” the musical based on Garry Trudeau’s comic strip, which had been tepidly received on Broadway in 1983. That landed her in California, where, at the La Jolla Playhouse in San Diego, Sondheim was reworking another musical that had failed on Broadway, with Lapine directing. “I first met Marin when she was 24 and came in to audition for a production of ‘Merrily We Roll Along’ at La Jolla Playhouse,” Lapine recalled in an e-mail interview Thursday. “She seemed very young and very unsophisticated. She sang ‘Not a Day Goes By’ with such force and beauty that Sondheim and I hired her on the spot to play Beth. Ms. Mazzie viewed her role in “Merrily” as a turning point. “Being taught to sing ‘Not a Day Goes By’ by Stephen Sondheim himself? That’s something I will never forget,” she told BroadwayWorld.com. Back in New York, the connection paid off as “That was a big, big break for me in my career,” she told BroadwayWorld.com. Ms. Mazzie became a replacement player in “Into the Woods,” the Sondheim-Lapine hit. She then received a starring role in “Passion” alongside Donna Murphy and Jere Shea. Ms. Mazzie’s other Broadway credits included the short-lived play “Enron” (2010) and the Woody Allen musical “Bullets Over Broadway” (2014). One of her most rewarding Broadway experiences, she said, came in 2010, when she and her husband took over for Alice Ripley and Brian d’Arcy James as a couple struggling with her manic depression in “Next to Normal,” which had opened the year before. In addition to her husband, whom she married in 1997, Ms. Mazzie leaves her mother and a brother, Mark. In May 2015, Ms. Mazzie was in an “Encores!” presentation of the musical “Zorba!” at New York City Center. The day it opened was the day she received her cancer diagnosis. She went on anyway. “How ironic that I was singing: ‘Life is what you do while you’re waiting to die. Life is how time goes by,’” she told the Times that year, quoting a lyric from the show.